A recent study suggested based on modern samples that Greeks hadn't changed much since ancient times. Now that's been proven with ancient DNA from Bronze Age Minoan and Mycenaean Greeks. Their ancestry is mostly Anatolian Neolithic farmer with some Caucasus/Iran and less Russian/Siberian admixture (the last two related to the spread of Indo-European languages), they had dark hair and dark eyes, and there was no difference between the elites and common people. They're genetically closest to modern Southeastern Europeans, and not to Northern Europeans or Africans as different people have claimed. The origins of the Bronze Age Minoan and Mycenaean cultures have puzzled archaeologists for more than a century. 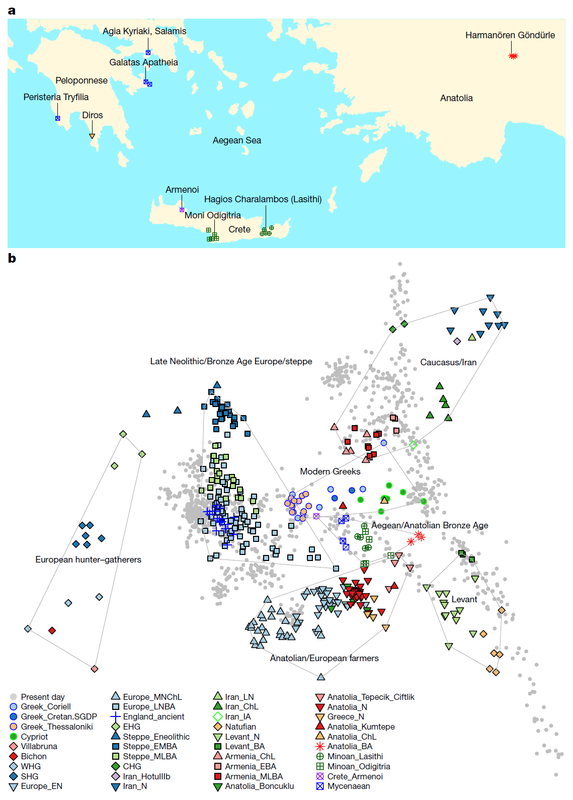 We have assembled genome-wide data from 19 ancient individuals, including Minoans from Crete, Mycenaeans from mainland Greece, and their eastern neighbours from southwestern Anatolia. 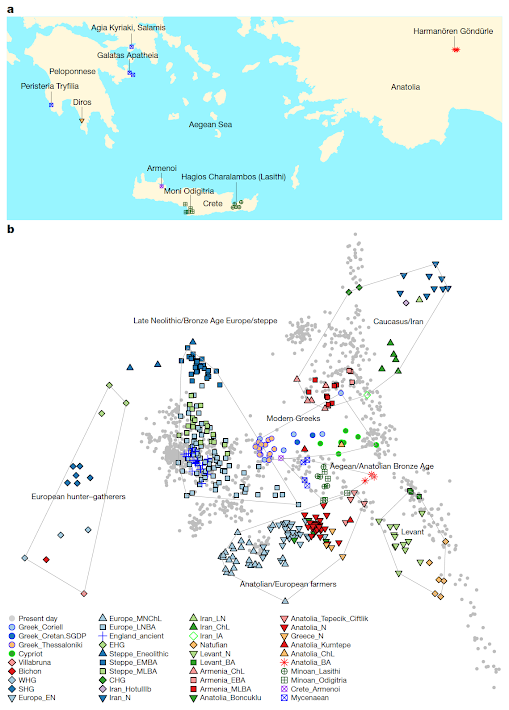 Here we show that Minoans and Mycenaeans were genetically similar, having at least three-quarters of their ancestry from the first Neolithic farmers of western Anatolia and the Aegean, and most of the remainder from ancient populations related to those of the Caucasus and Iran. However, the Mycenaeans differed from Minoans in deriving additional ancestry from an ultimate source related to the hunter–gatherers of eastern Europe and Siberia, introduced via a proximal source related to the inhabitants of either the Eurasian steppe or Armenia. Modern Greeks resemble the Mycenaeans, but with some additional dilution of the Early Neolithic ancestry. Our results support the idea of continuity but not isolation in the history of populations of the Aegean, before and after the time of its earliest civilizations. The elite Mycenaean individual from the ‘royal’ tomb at Peristeria in the western Peloponnese did not differ genetically from the other three Mycenaean individuals buried in common graves. Other proposed migrations, such as settlement by Egyptian or Phoenician colonists, are not discernible in our data, as there is no measurable Levantine or African influence in the Minoans and Mycenaeans, thus rejecting the hypothesis that the cultures of the Aegean were seeded by migrants from the old civilizations of these regions. 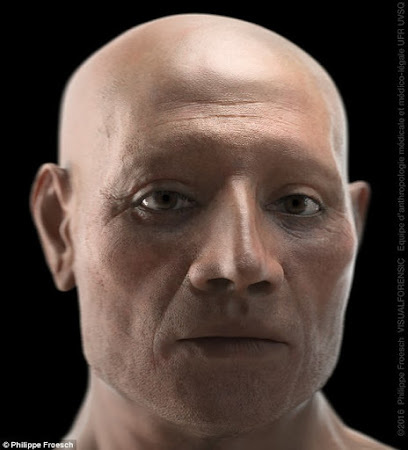 Phenotype prediction from genetic data has enabled the reconstruction of the appearance of ancient Europeans who left no visual record of their pigmentation. By contrast, the appearance of the Bronze Age people of the Aegean has been preserved in colourful frescos and pottery, depicting people with mostly dark hair and eyes. We used the HIrisPlex tool (Supplementary Information section 4) to infer that the appearance of our ancient samples matched the visual representations (Extended Data Table 2), suggesting that art of this period reproduced phenotypes naturalistically. 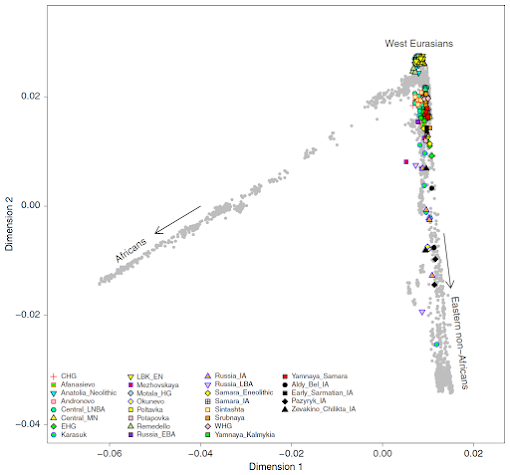 We estimated the fixation index, FST, of Bronze Age populations with present-day West Eurasians, finding that Mycenaeans were least differentiated from populations from Greece, Cyprus, Albania, and Italy (Fig. 2), part of a general pattern in which Bronze Age populations broadly resembled present-day inhabitants from the same region (Extended Data Fig. 7). The modern Greek samples used in the study for comparison are not the best. Thessaloniki is in the north of the country, the Coriell database doesn't provide specific origins, and there are only two Cretans. I believe that if Mycenaeans were compared to their descendants in the Peloponnese, continuity would be nearly perfect instead of just very strong. Lazaridis et al. "Genetic origins of the Minoans and Mycenaeans". Nature, 2017. A 3,500-year-old noble Egyptian called Nebiri has been brought back to life through modern forensics. Scientists have reconstructed the face of the ancient mummy, and discovered he had a prominent nose, wide jaw, straight eyebrows and moderately thick lips. Nebiri is thought to have been a member of the Egyptian elite who served as the Chief of the Stables, looking after royal horses, during the reign of Thutmoses III, a pharaoh from the 18th Dynasty of ancient Egypt. His remains were discovered in the Valley of the Queens in Luxor in 1904, but as the tomb has been plundered, just his head and jars containing his organs remained. 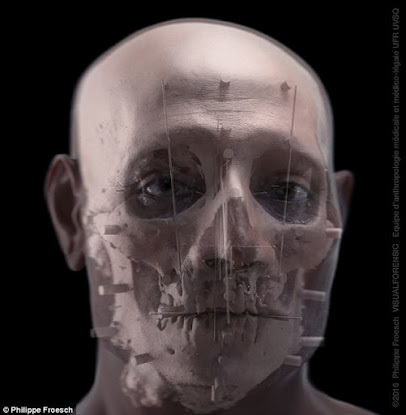 Researchers from the University of Turin have now used a range of facial reconstruction techniques to produce an impressive facial approximation. To reconstruct his face, the researchers used a mixture of computer modelling and anthropological research. The team then used a computer programme to start to build up a picture of the Egyptian's face. Speaking to Live Science, Raffaella Bianucci, who led the study, said: 'He was between 45 [and] 60 years old when he died. Shivali Best. "The face of Nebiri revealed: Scientists reconstruct the head of the ancient Egyptian 'Chief of Stables', 3,500 years after he died of heart failure". MailOnline – Science & Tech, 11:01 BST, 20 June 2017. Nordicists have often claimed that Iron Age Scythians were blonde, blue-eyed "Aryans" most similar to modern Northern Europeans, but ancient DNA analysis shows they were a mix of Yamnaya people from the Russian Steppe (who were mostly brunet) and East Asian Mongoloids. During the 1st millennium before the Common Era (BCE), nomadic tribes associated with the Iron Age Scythian culture spread over the Eurasian Steppe, covering a territory of more than 3,500 km in breadth. 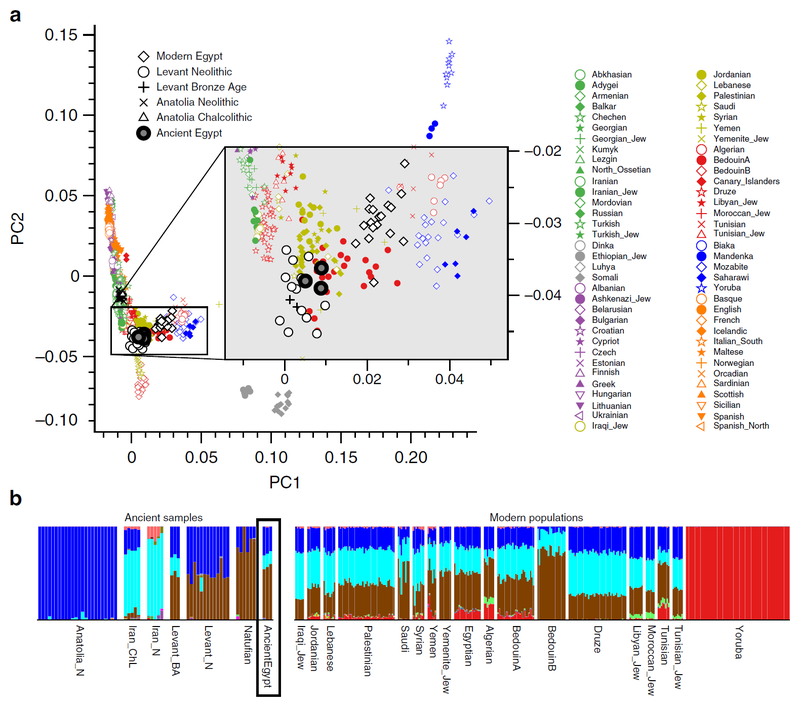 To understand the demographic processes behind the spread of the Scythian culture, we analysed genomic data from eight individuals and a mitochondrial dataset of 96 individuals originating in eastern and western parts of the Eurasian Steppe. 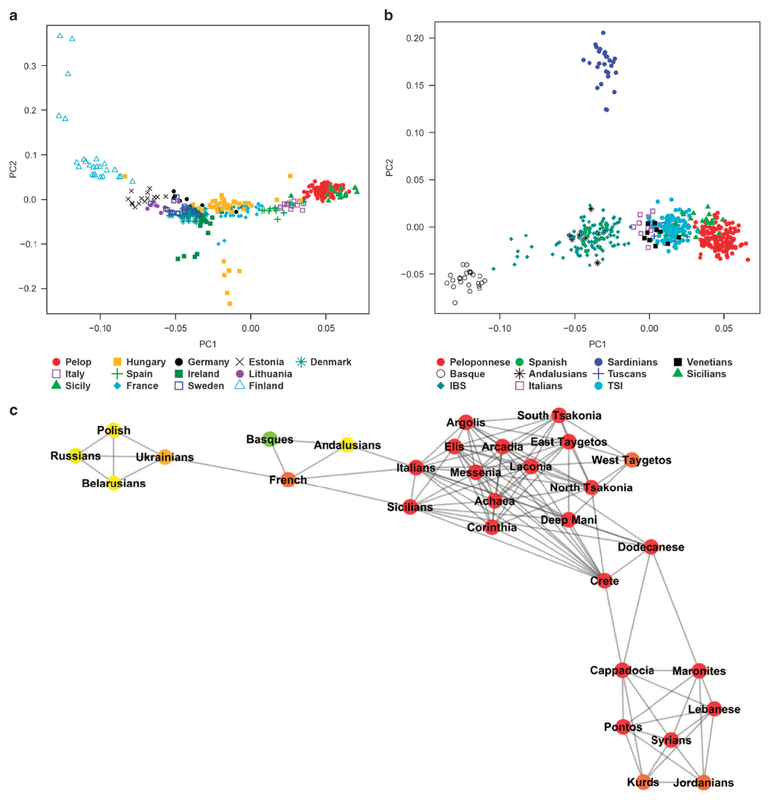 Genomic inference reveals that Scythians in the east and the west of the steppe zone can best be described as a mixture of Yamnaya-related ancestry and an East Asian component. Demographic modelling suggests independent origins for eastern and western groups with ongoing gene-flow between them, plausibly explaining the striking uniformity of their material culture. We also find evidence that significant gene-flow from east to west Eurasia must have occurred early during the Iron Age. Since the PCA of west Eurasia in Fig. 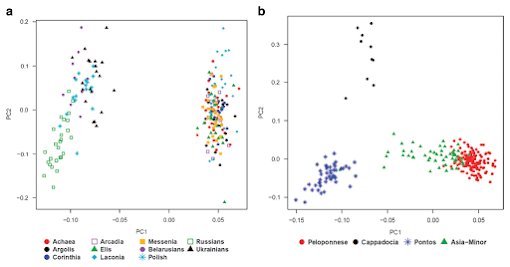 4 does not allow one to examine the ancient samples in relation to contemporary East Asian populations, we also carried out PCA of all 2,345 modern individuals in the Human Origins dataset, onto which we also projected the ancient individuals (Fig. 5). 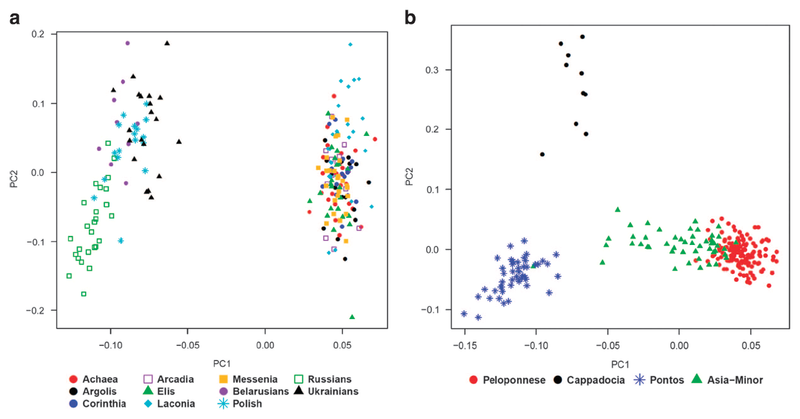 It is evident from this PCA that ancestry of the Iron Age samples falls on a continuum between present-day west Eurasians and eastern non-Africans, which is in concordance with the mitochondrial haplogroup analyses. 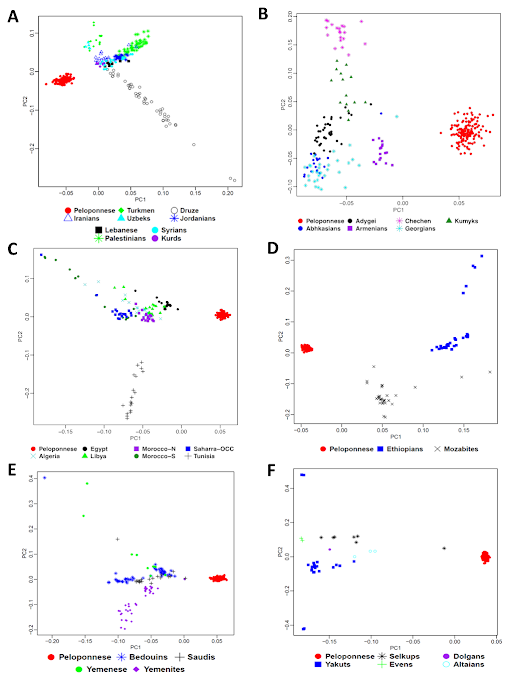 The eastern Scythians display nearly equal proportions of mtDNA lineages common in east and west Eurasia, whereas in the western Scythian groups, the frequency of lineages now common in east Eurasia is generally lower, even reaching zero in four samples of the initial Scythian phase of the eight to sixth century BCE (group #1 in Fig. 2), and reaches 18–26% during later periods (sixth to second century BCE; #2 and #3) (Supplementary Table 7). Figure 5 | Principal component analysis. 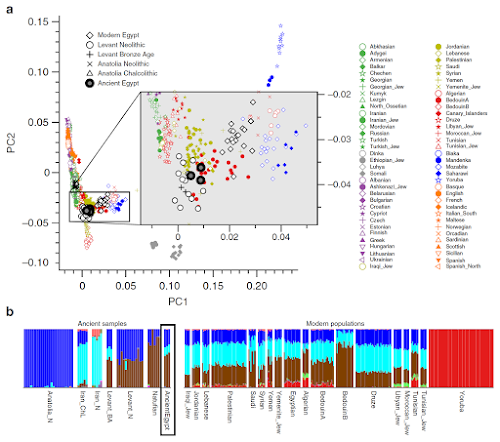 PCA of ancient individuals (according colours see legend) projected on modern individuals of the Human Origins dataset (grey). Iron Age Scythians are shown in black; CHG, Caucasus hunter-gatherer; LNBA, late Neolithic/Bronze Age; MN, middle Neolithic; EHG, eastern European hunter-gatherer; LBK_EN, early Neolithic Linearbandkeramik; HG, hunter-gatherer; EBA, early Bronze Age; IA, Iron Age; LBA, late Bronze Age; WHG, western hunter-gatherer. Unterlander et al. "Ancestry and demography and descendants of Iron Age nomads of the Eurasian Steppe". Nature Communications, 2017.